Only pictures in the .jpg/.jpeg file format are used to create Smart Folders but all pictures are backed up to Verizon Cloud. The Smart Folder is located in the Albums section of the Photo tab in your online Verizon Cloud account. Navigate: My Verizon > My Devices > My Cloud Media & Contacts > Photo > Albums. During the initial backup, a folder must contain at least 5 pictures and 90% of all the pictures must be in the .jpg/.jpeg format to generate a Smart Folder. After the initial backup, if more pictures are added to a folder that had less than 5 pictures in it a Smart Folder is still not created. Creation of a new folder is required. New folders being backed up must contain at least 5 pictures in the .jpg/.jpeg format and 90% of all the pictures must be in the .jpg/.jpeg format to create a Smart Folder. While signed into the Verizon Cloud desktop app, click Settings. 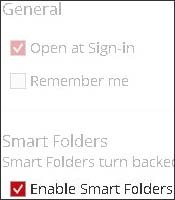 Click Enable Smart Folders to enable or disable the Smart Folders feature.